Everybody knows that a black surface exposed to the sun will become much hotter than a white surface. When a dark surface is exposed to the sunlight it absorbs more solar energy than the lighter surface. Unfortunately our houses mostly have dark roofs as lighter colours will look dirty and ugly after a short time due to air pollution. This is a problem for houses located at the “sun belt” of the earth, a lot of heat from the sun is collected over the roof. 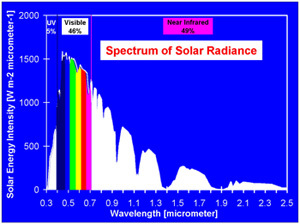 Imagine a paint could have any colour in the visible but would be white for the rest of the solar spectrum. Much less heat would be absorbed even with darker colours. IPS has developed paints and coatings for building applications, which reflect significantly more solar energy than standard paints with the same colour. This means less heat is lead into the house and finally less heat must be compensated by the air conditioning. Besides the aspect of energy saving the coating itself does not become as hot as standard paints, and this will increase the lifetime of the coating. This photo shows the same scene with a special camera for the near infrared. 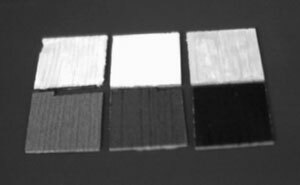 We can see that the upper solar reflective coated roof tiles appear reflective white. 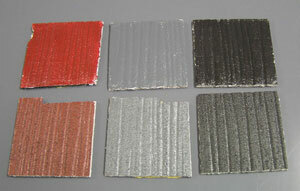 these roof tiles will stay up to 30°C cooler under the sun than the standard coated roof tiles. 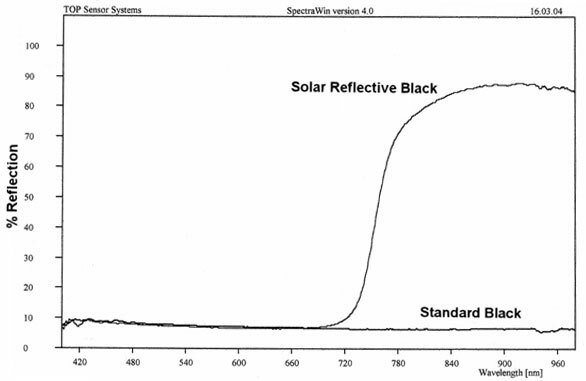 The diagram shows the reflection of a standard black coating versus a solar reflective black coating over wavelength from 400 to 980 nm. In the near infrared at wavelengths over 700 nm the reflection of the solar reflective coating is almost at 90% and so it will be reflective white in a wavelength region where the sun still has 50% of its energy. and look for Paliogen® Black L 0086, Paliogen® Black S 0084 and Lumogen® Black FK 4280.